A fun and safe playhouse will nourish your child’s sense of play and let their imagination run free. We’ve compiled some tips and ideas to help you make the best choice for your family. Playhouses are a wonderful place for fantasy and creative play. One of the most important considerations in locating your child’s playhouse is where to build it. Locate it in a convenient place where the access is good and where your kids feel totally comfortable. Unless you want to take the trouble to run electricity, it’s also a good idea to build your playhouse in a spot that receives lots of natural sunlight. Aesthetics are important: you may choose to highlight your playhouse by making it the center of attention or create a secret hideaway by blending it into the landscape and making it an adventure for your children. 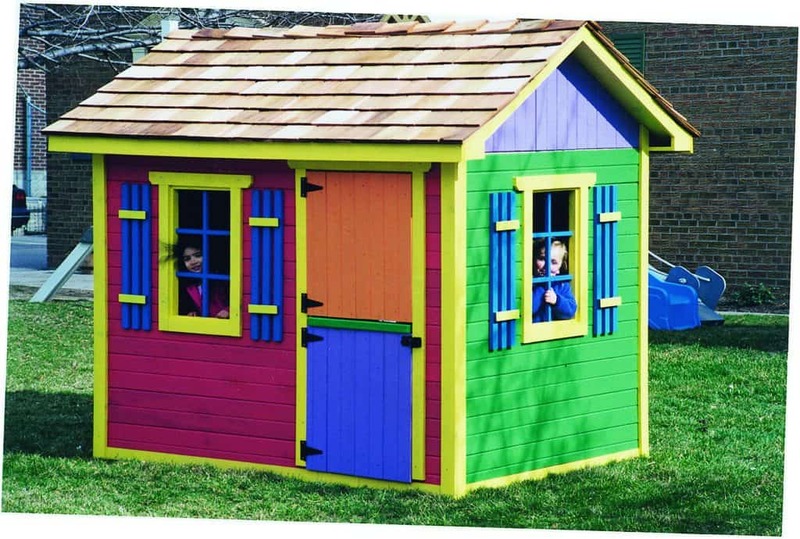 Although playhouses are usually small, you should be mindful of the building’s relation to other structures that you may have on your property. Also think about the pros and cons of your preferred site in all four seasons. The surrounding foliage (and weather) can look very different from one season to the next. All of these considerations may have some impact on where you decide to build your playhouse. Note: Playhouses are almost always under 100 sq. ft. and as such are exempt from most zoning and permit considerations. In fact, we’ve never run into a situation where someone needed a permit. If you are planning on building a larger playhouse you may want to check with your municipality to ensure that you are meeting the local zoning and permit requirements. By the way, it’s not only your child that needs their personalized space! Check out our home studios and custom sheds for ideas on man caves and she-sheds! Make sure that your playhouse is big enough for its intended use, however not so big that your kids feel lost. The true appeal of a playhouse is that it is the one thing that is designed and built to your child’s scale. If you want to be sure, once you’ve decided on a size, place stakes in the ground and outline the walls of your playhouse with a string or garden hose. This helps to give you a better idea of the size and how it will fit into your situation. Everything we use is safe; the windows are made of Plexiglas, sharp corners are minimized, and there is no pressure treated wood whatsoever in our playhouses. 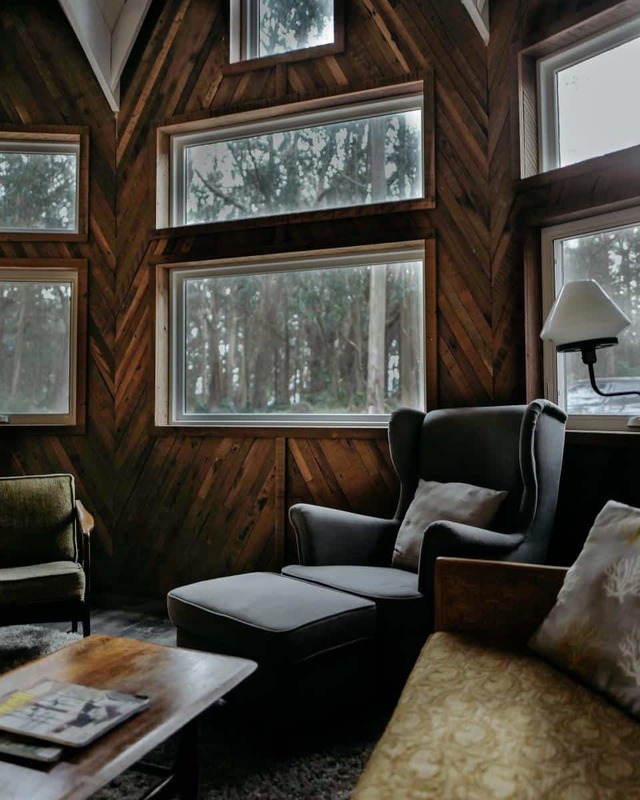 Most of our products are constructed from a premium grade of western red cedar or Canexel maintenance free wood fiber siding (available in many vibrant colors). We only use the finest materials on the market, so be assured that what you get is truly top of the line we don’t mess around. Different materials create different looks so you may want to consider that if you want your design to extend or complement the architectural style of your house and other structures on your property. Click for detailed information on our materials and siding. Be sure to spend sufficient time browsing the playhouse styles below and our playhouse photo gallery to see what creative designs others have come up with. Let your children be part of this decision making process in choosing the style. After all, they’re the ones who will be using it. Upon taking a vote, make your final decision based on the style you feel fits into the surrounding landscape. Don’t worry about the playhouse matching your house, not every thing needs to match, and why not be a little eclectic, it’s fun for the kids and you alike! The inside of your playhouse requires some careful thought. Shelving, hooks, drop-down counters and seats: these are the things that help to jumpstart imaginations and ensure that your children embrace their new play space right away. What ever your requirements, we have oodles of options to choose from so you shouldn’t have much trouble achieving a good fit for your kids. Bear Club Playhouse - From the soaring gabled roof, to its functioning windows and unique Dutch door, this playhouse begs to be played in and will provide countless hours of enjoyment for your children. Petite Pentagon Playhouse – Designed with kids in mind; this five-sided playhouse fits snugly into a corner and provides a unique interior for a game of hide and seek. A dormer tops the hip roof, providing extra light for reading, playing with dolls, or chatting with pals. Peach Pickers Porch Playhouse – Having your own porch as a child is a pretty special thing. This playhouse has it all – the porch adds a fun factor that can’t be beat. There are several important considerations when planning your home studio, but with an eye for detail and careful planning your Summerwood Studio can easily become your own personal sanctuary. The first question to ponder is “what do I intend to use it for?” Some of the most common applications of our home studios are for home offices, personal exercise studios and as guest houses. To some extent the answer to this question will impact all others. We suggest you make a list of all the functions you would like your studio to serve as part of the planning process. Where to Build your Home Studio? Studio Location – Depending on its use, you may want to build your studio in a spot that receives lots of natural light. Especially if your going to be using it for arts and craft activities. If you’re using it as a guest house or the like, you’ll most likely want to build it away from the main house for privacy. If it’s a home office, then building it closer to the main house for convenience may be something you’ll want to consider. As you can see the use of your studio greatly determines other design and construction factors. Other things to think of when choosing a location may be proximity to water (i.e. do I need a hose, do I want to plumb it for a sink or toilet), ventilation and electricity (lighting or outlets may be required, especially when used as a home office). Conversely, you may preclude the need for some of these things by including large opening windows and vents and other design elements. Also think about the pros and cons of your preferred building site in all four seasons. The surrounding foliage (and weather) can be very different from one season to the next. All of these considerations may have some impact on where you locate your home studio. Once you have decided on a size for your home studio (see ‘choosing a size’ below), it’s a good idea to stake it out on your premises to ensure that the fit is comfortable for your needs and that the location is harmonious with your landscape. Home Studio Zoning – Decisions made on the size, location, and style of your garden studio are not entirely in your hands. Be sure to check with your municipality to ensure that you are meeting the local permit and zoning requirements. 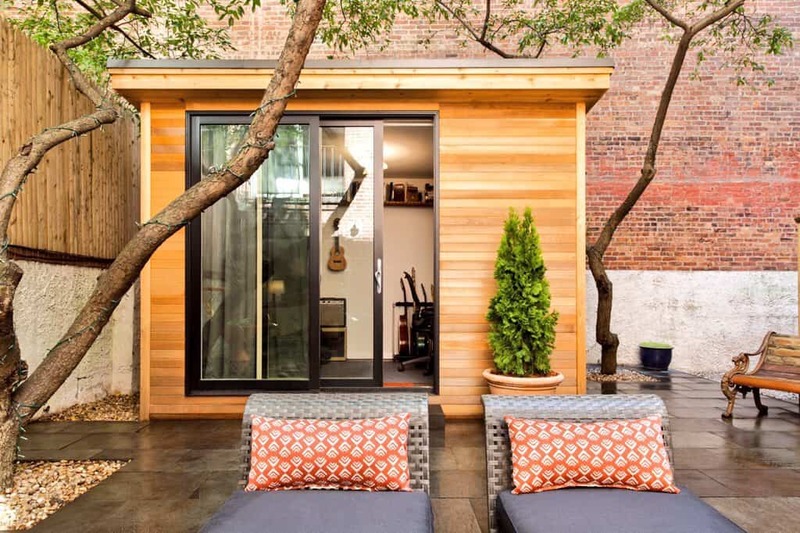 If your garden studio is under 100 sq. ft. you will not likely require a permit, however, there are usually some restrictions such as a two or three foot set backs from a property line to contend with. Please see permits and zoning for more information. Location Grade – Ideally your site should be level, with a slight pitch towards the rear. This will allow drainage of water without having to excavate. Your home studio may be located where the ground slopes more steeply (i.e. greater then 12″ from one side to the other), however if this is the case more thought should be put to the foundation. Try to avoid positioning your home studio at the bottom of a hill. If you do, ensure that you beef up the drainage with a 6″ gravel bed or some other appropriate foundation. If there is a slope and you are planning to store large items, be sure to consider adding a ramp for easy storage and access. Our range of studio styles, sizes, and options will allow you to design and build your home office studio for functionality without having to compromise on style. Be sure to spend sufficient time browsing through all the home office studio styles as well as our studio photo galleries. You’re sure to benefit from the many designs that others have come up with before you. Choose a home studio style that reflects your personal taste and fits in to the landscape. Don’t worry about matching your studio to your house, not every thing needs to match. You can customize your studio to your heart’s content, implementing your personal flair along the way of course. Most of our home office studio styles are differentiated primarily by roof lines (i.e. gable, hip, salt box) so this is an important consideration as well. Inside your Home Studio – It’s also important from the beginning of your decision making process to think about the interior design of your studio. Partitions often work well to divide space for the various different uses (although the ‘open’ concept has its appeal as well). Hooks, shelves, benches, bins and other creative ideas are useful in helping to keep things organized. Whatever your requirements, we have oodles of options to choose from so you shouldn’t have much trouble achieving a good fit to your tastes and needs. It’s smart to think about how you may want to cultivate the landscape in the immediate surroundings. Shrubs, flowers, and trellises draped with vines can be a great design addition to your studio’s overall look and feel and will help to define the space. Many people also choose to lay flagstone, interlocking pavers, or use other methods to create a pathway to the door of your home office studio. A little garden decor provides nice finishing touches to a tranquil space. 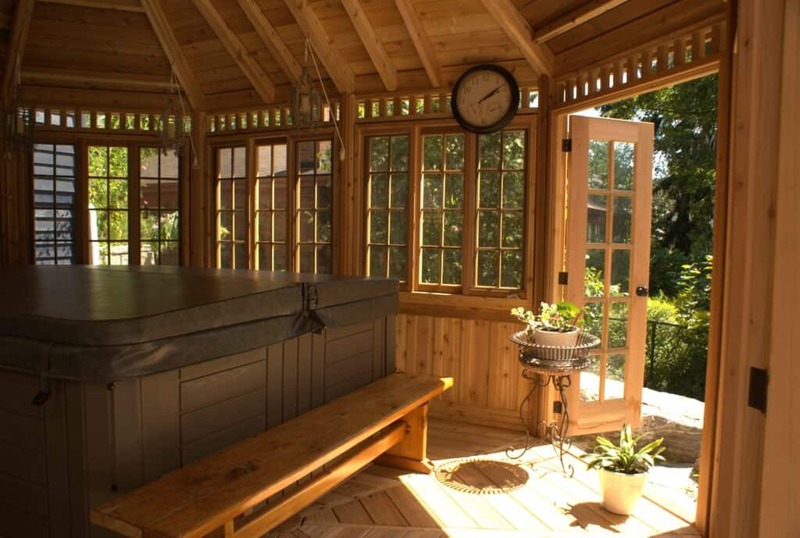 Strategically placed, things like trellises, pergolas, cupolas, lights, wind chimes, wheelbarrows, birdhouses – and even your favorite piece of weathered furniture can go along way to creating the outdoor sanctuary your Summerwood garden studio was intended for. Clearly the key in selecting the size of your studio is to ensure that your space is large enough for its intended purposes while remaining proportional to the setting. What is the studio being used for? Is it a home office? A home recording studio? Exercise center, or guest house? Think of the activities that you have in mind for your hideaway and plan accordingly. If you intend to share you space with items currently residing in your yard, make sure to allow for enough room for you and your stored items. A dual-purpose studio doesn’t have to be huge, but it does need to be large enough to do what you want it to do. Consider assigning different uses to different spaces and incorporate some thoughtful and inventive design into your building plan. Once you’ve decided on a size, place stakes in the ground and physically outline the sides with a string or garden hose. Adjust the stakes until you’re happy with the size and record the dimensions. This is the best way to visualize your studio in its intended space. Note: if you have chosen an inward opening ‘D’ series door, you will need to have four feet of clearance inside your studio. Again, be sure to check with your zoning office for any municipal laws that may require you to have a permit before you build a structure of a certain size. It’s always better to be safe than sorry! Please feel free to contact us at any point in the planning process and we will provide you with as much help, as you need. Most of our products are constructed from a premium grade of western red cedar or Canexel maintenance free wood fibre siding (available in many vibrant colors). We only use the finest materials on the market, so be assured that what you get is truly top of the line – we don’t mess around. Different materials create different looks so you may want to consider that if you want your design to extend or complement the architectural style of your house and other structures on your property. Click for detailed information on our materials and siding. There are a variety of options when it comes to roofing materials and here you will have to make an important decision. Obviously Asphalt shingles are the most economical and are readily available in a variety of colors at your local building supply store. Although asphalt shingles are not packaged with our structures, cedar shingles are available as an option. They are truly beautiful and will last a lifetime. Corrugated metal roofing is another possibility. Available in many colors, this is an attractive option and is very adept at keeping the snow off your roof (if you live in colder climates). Another popular choice is clay roofing tiles. Many homes use this tile and it’s nice to have the two structures share this similarity. Just be sure to mention this to our design team, as clay tiles add extra weight and the structure needs to be beefed up a little to accommodate these tiles. Build your Home Studio yourself, or hire a Contractor? Decide on whether you’re going to take on the project of building your studio yourself or if you’re going to hire someone to do it for you. Size of the studio and the complexity of its design will decide this to a large degree. However, most of our customers tackle the project themselves and quite enjoy it; a form of therapy or family bonding if you will. If you are an accomplished ‘do-it yourselfer’, or are ready to make your debut, make sure that you have both the time and the energy required for the task at hand. If not, be sure to have a look at our how to hire a contractor’ package. For detailed information on assembly and the tools required for the assembly of your studio please click here. Style is a personal issue, but basically it comes down to which style suits you best. Remember, all of our studio buildings can be customized to your own personal requirements. They range in size from as small as you want to as big as you want. Get creative and make the size unique to your space. Palmerston Home Studios - The Palmerston gable roof design is our most basic and most popular. The look is clean and the space functional; roof trusses double as storage space for sports equipment and other items that need to be tucked away. Dormers add a nice touch to this style. Catalina Home Studios -The five sided roof design certainly adds an interesting dimension to your landscape. A great choice nestled into a corner facing your yard. Sonoma Home Studios - The Hip Roof design offers a little more flair and versatility. The use of rafters instead of trusses also creates more of an open feeling. This style is easily dressed up with the doors and windows of your choice. Melbourne Home Studios -This unique design offers an understated elegance that is not usually associated with studios. The Melbourne is a big hit with our landscape architect clientele. Urban Studio Home Studios - Our Urban Studio is defined by its modern design and rugged natural good looks. This spacious design is ideal for as a home office – the space can be used for equipment storage or can easily accommodate a desk, sitting area and the rest of your accessories. Coventry Home Studios - For the discerning homeowner, our new Coventry range of garden buildings offer a joyous blend of craftsmanship, style, and rich English Garden tradition. Copper Creek Home Studios - This studio has a steep roof pitch, providing just the right amount of drama. Its elegant design performs well in any setting and can be dressed up (or down) to suit all of your needs. Glen Echo Home Studios - Form meets function: the Glen Echo studio is both an attractive accent to your landscape and a practical spot to spend your days. The overhang doubles as an attractive porch for a welcome break in the middle of a hard day’s work. Verana Home Studios - The Verana design is sure to light a creative spark. Choose your siding, windows and doors and make the space as personal as what you’re using it for. It offers an inviting space to use for relaxing during those long days. Windsor Home Studios - The Windsor is regal and striking – an ideal artist studio. With the addition of large windows and French doors, this style is certain to inspire creativity. San Cristobal Home Studios- is a classic beauty that is truly unique when used as a studio. This exquisite structure is fully enclosed and comes with French doors and beautiful opening windows (complete with screens). If natural light is a priority, the San Cristobal is a wise choice.